Clayton Bissell was born on July 29, 1896, in Kane, Pennsylvania. After graduating from Valpariso University with a law degree, he enlisted in the Aviation Section of the U.S. Army Signal Corps on August 15, 1917. He was commissioned a 2d Lt and awarded his pilot wings on January 12, 1918, and then sailed for England where he received additional flying training and aerial gunnery training. Lt Bissell joined the 148th Aero Squadron in France in July 1918, and was credited with the destruction of 6 enemy aircraft in aerial combat during World War I. His next assignment was as commander of the 639th Aero Squadron in France and then on occupation duty in Germany from November 1918 to May 1919. Capt Bissell next organized and commanded the 27th Aero Squadron at Kelly Field, Texas, from September 1919 to May 1920, followed by service on the staff at Kelly Field from May to June 1920. His next assignment was as chief of the Tactical Operations Section in the office of the U.S. Army Air Service in Washington, D.C., from June to December 1920, and he then attended the Air Service Field Officer's School at Langley Field, Virginia, from December 1920 to June 1921. He remained at Langley Field, serving first as commander of the 14th Aero Squadron and then as an instructor in the Air Service Field Officer's School from June to November 1921, followed by service in the office of the Chief of the Air Service, as assistant to Brig Gen William Mitchell from November 1921 to January 1924. He served as advanced agent for an around the world flight from January to December 1924, and he then served as secretary of the Air Service Board at Langley Field from December 1924 to September 1926. His next assignment was as an instructor at the Air Corps Tactical School at Langley Field from September 1926 to August 1931, followed by the Command and General Staff School at Fort Leavenworth, Kansas, from August 1931 to June 1933. Col Bissell attended Army War College in Washington, D.C., from August 1933 to June 1934, and then completed the Chemical Warfare School at Edgewood Arsenal, Maryland, in October 1934. He was intelligence and operations officer of the 18th Pursuit Group at Schofield Barracks, Hawaii, from October 1934 to October 1937, and then served as commander of the group until July 1938. Col Bissell attended Naval War College at Newport, Rhode Island, from July 1938 to June 1939, and then served on the War Plans Division in the War Department General Staff in Washington, D.C., from July 1939 to February 1942. Gen Bissell next served as Air Operations Officer on the staff of the commander of the China-Burma-India Theater (CBI) from February to August 1942, and then as commanding general of U.S. Air Forces in the CBI (later renamed 10th Air Force) from August 1942 to July 1943. His next assignment was as assistant chief of air staff for intelligence at Headquarters U.S. Army Air Forces from August to December 1943, and then as assistant chief of staff for intelligence on the War Department General Staff from January 1944 to December 1945. 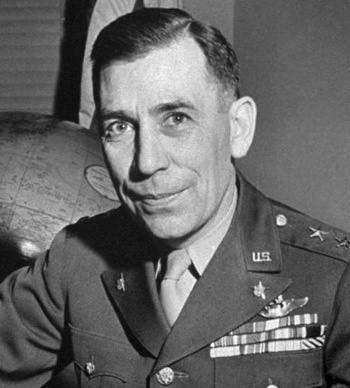 Gen Bissell served as Military Attache to Great Britain from January 1946 to July 1948, followed by service with Headquarters U.S. Air Forces in Europe at Wiesbaden, Germany, from October 1948 to April 1950. His final assignment was with Headquarters U.S. Air Force in the Pentagon from April 1950 until his retirement from the Air Force on November 1, 1950. Clayton Bissell died on December 24, 1972, and was buried at Arlington National Cemetery. The Distinguished Service Cross is presented to Clayton Lawrence Bissell, First Lieutenant (Air Service), U.S. Army, for extraordinary heroism in action in the vicinity of Jenlain, France, October 28, 1918. While a member of a flight First Lieutenant Bissell was attacked by greatly superior numbers of enemy planes. Lieutenant Bissell, observing an American plane attacked by eight of the enemy, dived into their midst, destroying one plane, whereupon he was set upon by three enemy Fokkers, one of which he shot down, driving the remaining planes to their own lines. His own plane was so badly crippled as to be beyond repair. The outstanding bravery displayed by Lieutenant Bissell greatly inspired the members of his squadron.